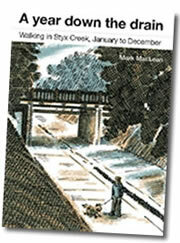 The book of the blog of the walk, A Year Down the Drain: Walking in Styx Creek, January to December, is available now. Peter Beale, in the Newcastle Herald, described it as “an enchanting read”, while ABC Radio’s Richard Fidler thought it “completely delightful” (you can hear me interviewed by Richard as part of his Conversations series here). Poet Bob Adamson described me as “the Gilbert White of the Styx”, which is absolutely lovely, and something I’ll cherish if I never receive another word of praise again. The cover is this lovely print of me and Jambo in Styx Creek, by Newcastle printmaker Christine Bruderlin. Update: thank you to everyone who has made the book such a success. 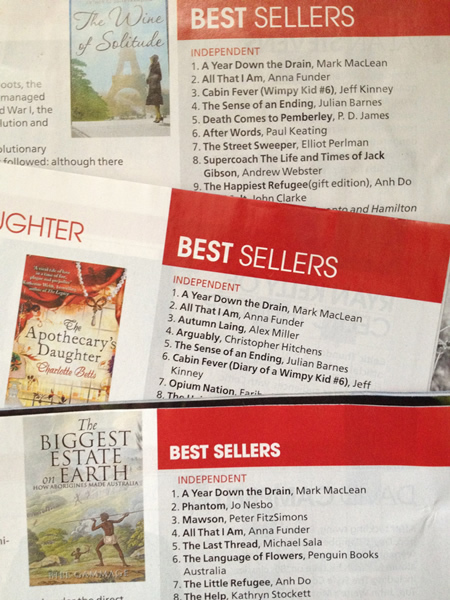 As you can see from the sales chart below, Styx Creek put everyone from Paul Keating to PD James in their place! It ended up coming in at #4 in the 2012 bestseller chart at MacLean’s Booksellers! I loved ‘A year down the drain’! Invoked memories of a couple of delightful years living in Hamilton North in the late 1980s. Definitely more of a creek than a drain! Just moved to Belgium after being in POwer St Islington for 5 years. I have loved the area, and this book which I read here in Belgium was fantastic. I enjoyed every page, I hope to return in the future and enjoy the drain in full splendour. Thank you for writing this book. So glad that you enjoyed the book! I have friends in Power Street; it’s so close to Throsby Creek and the park. Hope your part of Belgium gives you plenty of opportunity to explore the natural (and unnatural) world around you. Mark, just to say how much I loved your book. Your whimsical easy style blends just the right amount of memoir with such passion for this quirky, resilient pocket of post industrial Newcastle. As a newcomer here I am captivated by the silent past waiting patiently around every corner. Thanks for bringing Styx Creek to life! Thanks for the lovely feedback. Are you new to Newcastle or Hamilton North? This city’s full of forgotten corners, which is probably true of lots of cities that have lost their industrial core. Hope you continue to enjoy the blog! Hi Mark. We are new to Newcastle, live in Hamilton, and enjoy ranging far afield to explore….also enjoying discovering the local blogger/photographers including those listed on your site. Mark, check out Column 8 SMH Tues 19 and today Thurs 21 Feb for a thread about Styx Creek. Not too late for Hamilton North make itself known to the readership! Is there no subject under the sun untouched by Column 8?! I crossed the Styx this very morning, but with Jambo, not Pluto, and it didn’t cost me anything! Thanks for the heads up. Ooh! Kurri! You’ll have to point me to some areas of interest, Steve. That’s all new country to me. What are your drains like up there?